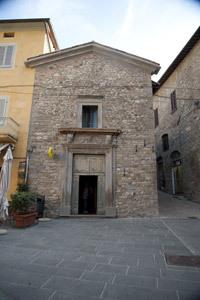 The Church of Santa Croce is located in the main square of the city it is of monastic origin and is among the oldest churches of Montone. In a document dated back to 1170, the Benedictines of the Monastery of St. Bartholomew of Camporeggiano donated the land on which the church was to be built; this monastery derived from other oldest monastery of Fonte Avellana, where Sant’Albertino Montone lived and died. He was a Camaldolese Prior who was invoked as a protector for the cure of the hernia. In his first pastoral visit, the Bishop Muzi mentions a work of art, “The Last Supper” by the Flemish Dionigi Calvaert, which is now visible in the Collegiata.